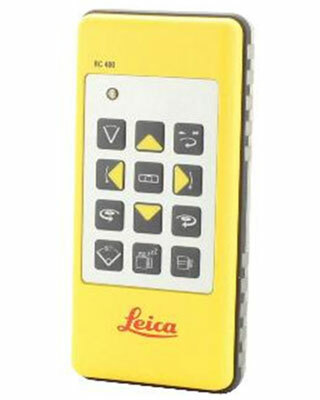 The Leica RC400 Remote Control 790352 is designed for use with the Leica Rugby 640/840 rotary laser level. This remote control has up to a 200-foot operating range and can be used to control the same functions as the rotary laser keypad. The RC400's keypad consists of 12 buttons that change the width of the rotary laser's scanning motion, tilts the X and Y axes, aligns the vertical plane and 90 degree split beam, and changes the direction and speed of the rotary head. The remote also features scan memory which returns the Rugby 840 to its last scanning motion position. Construction professionals will appreciate the RC400's sleep mode function which preserves the rotary laser's battery by putting it to sleep for two hours before powering off completely. As an added bonus, this remote control has an LED light that flashes with use to let you know that it is successfully sending a signal to the rotary laser. The RC400 remote control achieves all this on just two AA alkaline batteries with 70-hour battery life.